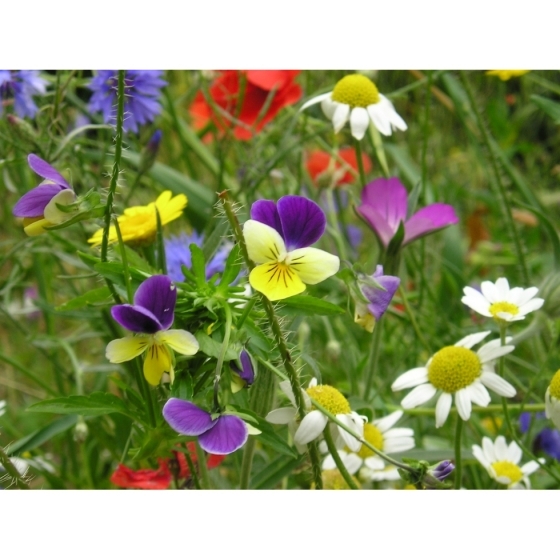 Cornfield Annuals seed mix -SPECIAL mix from Wildflowers UK. A 100% WILDFLOWER mixture of Cornfield annuals to provide instant colour where a short term effect is desired. Also suitable as NURSE CROPS for perennial meadow mixture sowings giving spectacular flowering in the first year and reducing weed invasion. Unlike other perennial wildflowers, Cornfield annuals do not specifically require poor soils and will often give stronger displays when sown on soil rich with nutrients. Cornfield annuals should always be sown onto bare soil and will not work well if sown into established grass. Sow at 2 grams per square metre or 8 Kgs per acre.